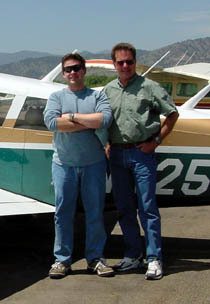 I flew with CPA instructor Mark Stevenson (right). Great instructor. The mountains have risen high enough in the windscreen that I can no longer see their peaks. No sky, no clouds, just earth. Trees, rocks, the occasional elk. Above me, the flatlander pilot. Mark glances at the altimeter. "Up 100 to 8,200," he says cheerfully. "No lower than that, please." He seems happy about his altitude choice. Up ahead, a vertical sheath of rock guards a narrow canyon above the Colorado river. Mohammed is coming to the mountains. We’re going to fly a canyon turn. There’s no way my plane can turn in such a small space, I think; maybe it’s possible, but I’ve got visions of aerobatic maneuvers in my head. Okay, maybe not aerobatic, but perhaps a chandelle or wingover. We surely can’t turn in this little spot. As the rock looms larger, Mark briefs me on the procedure. We’re already flying at ‘canyon speed,’ which in my Twin Comanche is 90 knots indicated airspeed. At the mouth of the canyon - close enough to touch the cliff, in my estimation -- we’ll turn to 60 degrees bank, shove the throttles full forward, and dump the flaps. That’s in a ‘1, 2, 3’ kind of order. We do it. 3 seconds later, we’re pulling a couple of Gs and letting the plane pivot around its wingtip. The sun-speckled river rotates on my port position light. As we roll out one hundred and eighty degrees from our original course, I am shocked to see that we’ve used only a fraction of the width of the canyon. In fact, I could have made this turn at 120, even 140 knots indicated. different airspeed and aircraft configurations. Note: these airspeeds are for a PA-30. This is real mountain flying. Thanks to the Colorado Pilots’ Association (CPA,) I found myself sacrificing a sunny weekend day beneath the Denver Centennial (APA) ATC Tower. I munched on danishes as FAA Aviation Safety Counselor Vern Foster introduced the instructors who would be teaching our mountain flying ground school. The CPA offers this course twice per year for the reasonable fee of $145. I was drawn here specifically because of my interest in mountain flying and high-elevation operations, and judging from the turnout (estimated 40 pilots) there were quite a few others who shared my curiosity. The pilot experience level ranged from recently graduated private pilot to instructors and ATPs; the airplanes represented ran the gamut from 172s and 182s, to a fella with a Baron and even one with a new Cirrus SR-22! There were plenty of renter and owner pilots alike. 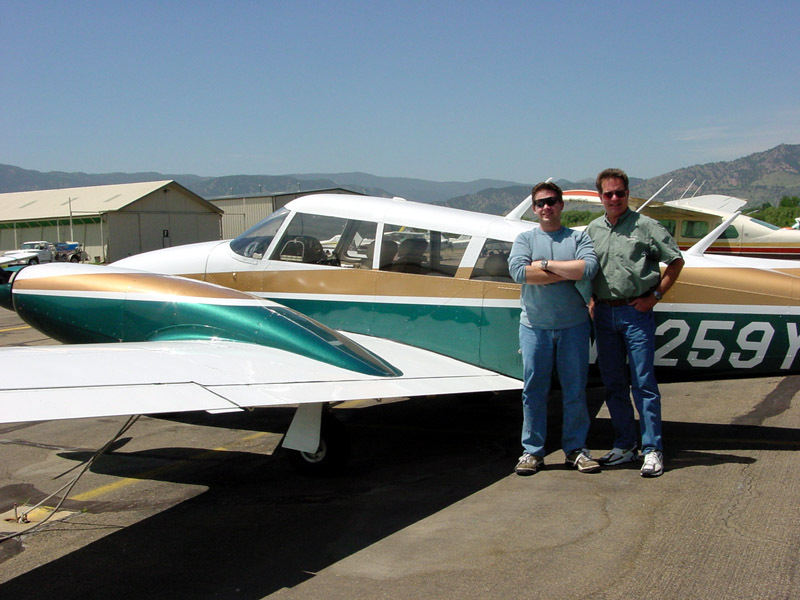 I was one of only two twin owners; despite the fact that the course was obviously aimed towards single-engine operations, multi-oriented materials were provided. "Over time, the course was refined into the highly professional production that I was treated to in June of 2002; slick materials, well-organized lessons, and top-notch instructors." The Mountain Flying course was built by pilots for pilots. Taking note of the number of high-elevation accidents attributed to pilot error, the CPA began offering the mountain flying course to pilots in 1986. It was an attempt by locals to stem the tide of fatalities resulting from lack of pilot knowledge. Over time, the course was refined into the highly professional production that I was treated to in June of 2002; slick materials, well-organized lessons, and top-notch instructors. The Mountain Flying Course consists of two components, one of which is optional. I was attending the one-day ground school; for an additional fee, the pilot may elect to fly with a CPA-approved instructor on a mountain route into some of North America’s highest elevation airports. The vast majority of the class elected to take the flying portion; indeed, this is some of the best dual a flatlander will ever get. Next: Weather, Terrain, and Density Altitude.